Kingscliff nursery has so many lovely views to look at whilst you roam the nursery at your leisure, To the west there is Mt Warning, on a clear day is quite a sight. To the east, the lovely southern beaches, from Kingscliff to Hastings Point. Set amongst the Cudgen hinterland, the e famous red Volcanic Soil, anything will grow from huge palms to sweet potato, which is what the region has to offer. Our aim is to provide all customers with a happy face and happy plants. Ask any of your staff about your garden, they are all trained and been working in the industry for some time. 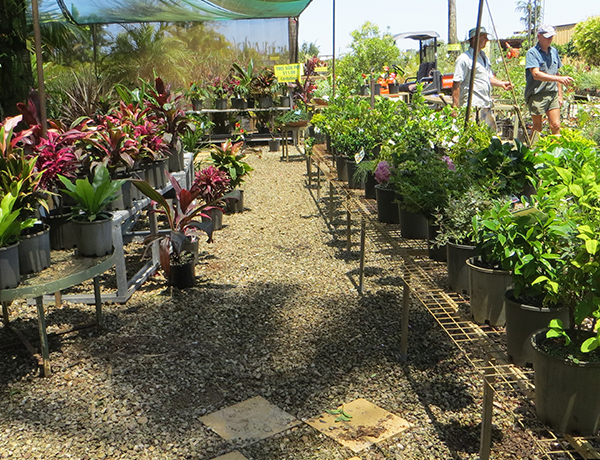 We pride ourselves at this nursery to try to have a plant for every area for the garden. If we do not have your plant specifically we can always substitute with a close suitable one. Tips on designing your new garden, including landscape design and companion planting.